For years I grew sick and tired of people hating and being hated. Blaming and being blamed. Judging and being judged. Shaming and being shamed. Our country has become broken and divided – and we must learn to get along. We all share in the responsibility of how our future will look. Together we can…WE MUST work together to bring back civil discourse and treat each other with greater respect and decency. That it’s imperative, for the good of society, to ascend up to the ridge, that highest part of the mountain, where we can see both valleys and discover that there is beauty on both sides. I began to see an evolving society where more and more people ascended to the ridge, committed to walking together in the spirit of kindness, non-judgement, peace and acceptance. People were happier, less angry, more friendly…..the sky looked brighter…and the world became a better place. When we commit to Walking the Ridge, and live it on a daily basis, WE CAN CHANGE THE WORLD. I See You. I Hear You. I Respect You…I Walk the Ridge. Will You? SEEING means seeing people as humans first. For who they really are , through their background and experiences – not the label we put on them when they disagree in view from us. HEARING is the ability to become a more active listener. Coming to an engagement with a true intent to learn – rather than to control a conversation. RESPECT means acknowledging an individual’s values and opinions – without being forced or compelled to change your own. To restrain from name calling, shaming, judging, and belittling. To honor the right of others to express their opinions. What is 'WALK THE RIDGE'? A movement that promotes the practice of greater civility and inclusion, through improved soft skills, habits of engagement, plus accountability. To ‘Walk The Ridge’ means to be committed to the growth of adding more civility into their daily communications and engagements with others, in all types of environments. A learning organization that teaches this practice to individuals, companies, colleges, and organizations. Do you really understand civility? Civility is a term that is often manipulated, misappropriated, and widely misunderstood. Civility IS NOT about politics. It DOES NOT have anything to do with losing or compromising your beliefs or views. It DOES NOT get magically switched on in people’s actions and behavior when leaders “call” for it. It DOES NOT meaningfully grow and sustain just because an organization adds the term into their core values, workplace policies, and public branding. Civility IS a set of soft skills that must be learned, practiced, and improved upon. It can be applied at work, in the home, within the community, and in the online environment. Those utilizing it consistently over time and in multiple engagements, will see lasting change in behavior and emotional intelligence. Many organizations do good work in promoting a vision of greater civility. Walk The Ridge believes that true improvement in civility ONLY happens when accompanied by BOTH personal and public accountability. This is why we advocate wearing your truth and investing in learning and training. 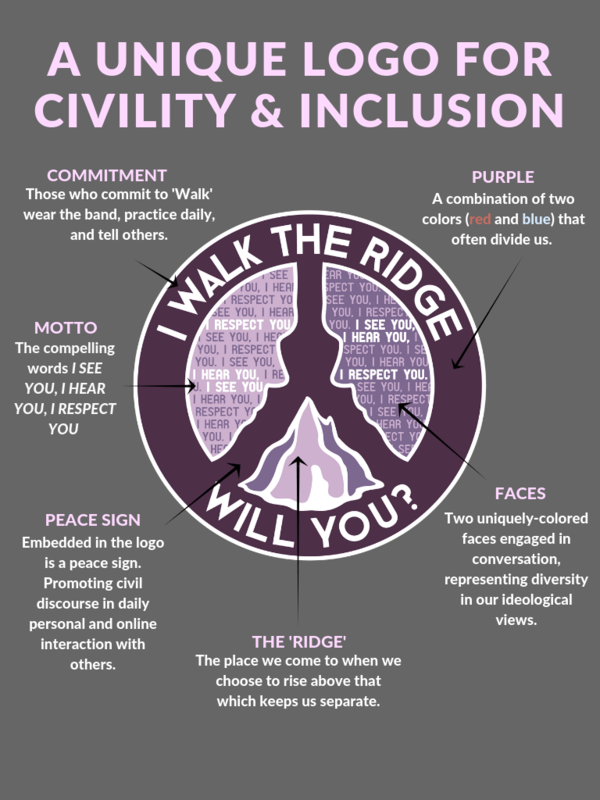 The mission of WALK THE RIDGE is to grow ‘Circles of Civility’. A bottom-up approach to teaching, spreading and building better habits for engagement and communication. Over time, as these circles overlap people and engagement, they will spread from families to communities to society. The bands function as an anchor, reminding wearers to engage others with more listening, learning, and respect in face-to-face and digital communication. When others notice you wearing the band, it also provides a ‘teachable moment’ from you to them – and to gift them a band. It also makes the wearer both personally and publicly accountable for their civil behavior. See our FREE GUIDE on Bands to read more. How are you a learning organization? One of the biggest misconceptions about civility is that we can just ‘BE civil’ – like turning on a light switch and then having the ability to shine without effort. HR, culture, and diversity leaders often miss taking civility seriously – until it turns into harassment or discrimination. Like so many other behaviors, civility is a soft or core skill that must be learned, practiced, and made into a supportive habit. Our FREE GUIDES allow your organization to get started. Please go to the Contact Us page. Reach out if you would like to have powerful speaking and training/consulting engagements for your school, company, conference, and other interested audiences. How do I support WALK THE RIDGE? We are a for-profit, for-purpose movement and learning organization. Our mission is to empower people to improve civility within themselves and spread it through others. Companies and organizations can support this FOR FREE (with no obligation – and free rewards) RIGHT HERE. 1) Wear your truth. Accountability is key to improving civility and empowering better behavior – plus it speaks volumes in influencing others. We recommend starting with wearing and sharing our unique wristbands – or finding other options by visiting OUR STORE. Certainly for any individual – but please also think about all your employees and even your national customers. Look at the gain for your church, high school, university, and organization members. Also, your dedicated followers, team fans, your local community, and certainly your friends and family. 2) Speaking to hearts and minds. From Silicon Valley keynotes to HR leadership conferences and Fortune 100 companies, we get heads nodding and purpose thriving. We enjoy delivering the goods to both small and very large audiences – connecting with highly-engaging content and powerful takeaways. High schools & local civic organizations (in the Los Angeles area) are always free. Learn more HERE. 3) Training. Start making changes in all environments today — with our FREE civility guides HERE. In the first quarter of 2019, we will be adding a learning platform for the site. It starts with a paid 45-60 minute course for companies and organizations. The purpose is to teach a core understanding and application of civility and to have such noted back to HR/people teams. This benefits risk management, organizational culture, and having communication improvement that positively catalyzes other business functions.